The digital x-ray project has been spearheaded by U.S. Rotary District 6440, which created a unique memorandum of understanding (MOU) that formalizes a partnership between District 6440 and Guatemalan Rotary clubs in Central American Rotary District 4250, Guatemala’s Ministry of Public Health and Social Welfare, the Radiological Society of Guatemala (RSG) and the Pan American Health Organization (PAHO). Also assisting in the effort are U.S. Rotary Districts 6600 and 7610. The MOU was signed in May 2013. Together, these partners will buy and install 29 digital x-ray units to serve the rural poor in Guatemala. The units will connect remote clinics to regional hospitals via the Internet. The project is anticipated to cost $2.5 million to complete. Eventually, project organizers hope to expand their efforts to other nations around the world. As many as four billion people around the globe – basically two thirds of the entire population -- have little or no access to simple x-ray technology, which is taken for granted as a basic health tool in most industrialized nations. Guatemala, one of the world’s poorest countries, is among the countries most in need of this technology. Health care outcomes in Guatemala are among the worst in Central America. Poor, rural people living there are impacted by injuries and other maladies that could be easily cured – or at least properly diagnosed – with x-ray technology. 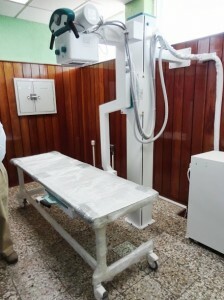 The digital x-ray project will dramatically expand the reach of health service to rural and poor Guatemalans by allowing their x-ray images to be read by physicians far from the physical location of remote x-ray clinics, via the Internet. “We deeply appreciate Rotary International’s support for this project, and the wonderful cooperation and assistance of the Guatemalan government, PAHO, RSG and our Guatemalan Rotarian partners,” she said. Guatemala was chosen for the Digital X-Ray Project because Rotary District 6440 has engaged in a variety of humanitarian projects in recent years there -- including the previous installation of a digital x-ray machine in Guatemala City in 2011 -- and because of the extreme need in Guatemala for digital x-ray technology. Rotary District 6440 estimates that its project could eventually impact more than one and a half million people in Guatemala. In addition, it will benefit Guatemala’s economy by creating new jobs at the 29 remote clinics and by potentially improving the long-term health and work productivity of Guatemalans through better access to medical care. “Most importantly, the unique multi-organizational public/private sector structure of this project – very different from previous Rotary-district models – will serve as an example to the rest of the Rotary world, demonstrating a new strategic approach to humanitarian efforts,” said Carlos Früm, past Rotary District 6440 governor and vice chair of the district’s committee overseeing the project. Rotary District 6440 will be represented at the Sept. 2 ceremony by Kerr and Früm.